Highly commended for WatchPro Showstopping Watch of the Year 2012 was the Piaget Rose Limelight Garden Party G0A37180. 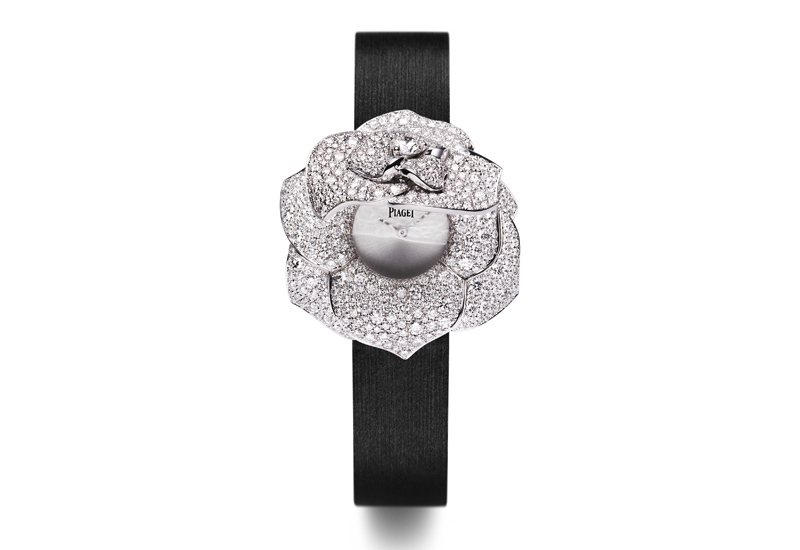 Piaget has used the rose motif across its watch and jewellery collections but this sublime timepiece adds new depth to its designs, creating a secret watch that is hidden under a blanket of diamond-encrusted petals. The 18ct white gold case is studded with 668 brilliant-cut diamonds totalling about 8.7cts, and houses Piaget’s own quartz movement. All those dazzling white stones are off-set by a sheer black satin strap, making this the ultimate dress watch that doubles as an elegant bracelet for those times when you’d probably prefer to sit and enjoy your evening without having to think about the time.